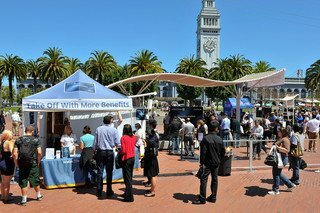 This year’s Great Strides Walk will take place at San Francisco’s Justin Herman Plaza on Saturday, May 16, starting at 9 a.m. This walking route will take more than 500 participants along the Embarcadero, around AT&T Park and then back to Justin Herman Plaza. The event is free of charge. In short: It will be an awesome day! The Great Strides Walk is the Cystic Fibrosis Foundation’s largest national annual fundraising event; last year, more than $43 million was raised by more than 250,000 participants in 600 cities nationwide. These walks will also be taking place in the greater Bay Area at Bishop Ranch (San Ramon), San Jose and Walnut Creek and are estimated to attract more than 2,000 participants, 5,200 donors and more than $750,000 in funds. Cystic fibrosis is a life-threatening genetic disorder affecting the lungs and digestive systems of approximately 30,000 adults and children in the United States, with more than 10 million Americans unknowing and symptomless carriers of the gene. The Cystic Fibrosis Foundation’s top priority is the acceleration of development of therapies that target the basic genetic defect.